Andersen Air Force Base is home to Pacific Air Forces' 13th Air Force and the 36th Wing, Air Mobility Command's 634th Air Mobility Support Squadron and several other tenant organizations. Andersen has always been, at its heart and soul, a bomber base - even when there were no bombers present. Andersen is one of four Bomber Forward Operating Location [BFOL] in the Air Force. These locations provide forward support to bomber crews deploying overseas in Europe, Southwest Asia and in the Pacific. The Air Force is establishing forward-deployed bomber beddown support at key locations throughout the world and Andersen is one of two critical bases in the Asia Pacific region. The other location is Diego Garcia in the Indian Ocean. Six B-52s and about 300 support people from Minot Air Force Base, ND, were the first to deploy in February 2004, following the decision to station a rotating bomber force at Andersen. Over the previous two years, B-52s had frequently deployed as part of the air and space expeditionary force bomber rotation cycle. The 23rd Expeditionary Bomb Squadron was the first squadron to deploy to Guam following US Pacific Command officials' decision to station a bomber force at Andersen. The continuous bomber presence is aimed at enhancing regional security, demonstrating United States' commitment to the Western Pacific and providing training opportunities that integrate bombers into joint and coalition forces in the Pacific. Guam's almost unrestricted airspace and the close proximity of the Farallon de Medinilla Island, a naval bombing range about 150 miles north of here, makes this an ideal training environment, officials said. Each B-52 sortie averages about eight-and-a-half hours from takeoff to landing. About an hour after takeoff, the bombers hook up with tankers to practice air-refueling. After two hours of refueling training, the bomber crew heads to the training range to conduct live bomb drops using M-117 munitions. On the way back here, the crew practices low-level runs over the ocean. Andersen made Air Force history 09 August 2000 when it became the first installation outside the continental United States to store 3,000-pound conventional air-launched cruise missiles. The CALCM is capable of flying approximately 600 miles to strike targets while keeping the launch aircraft and crew out of harm's way. The storage of CALCMs at Andersen is part of a continuing effort to build up the base's role as a bomber forward operating location. The significance of placing the CALCMs at Andersen is that they are forward deployed and immediately accessible. 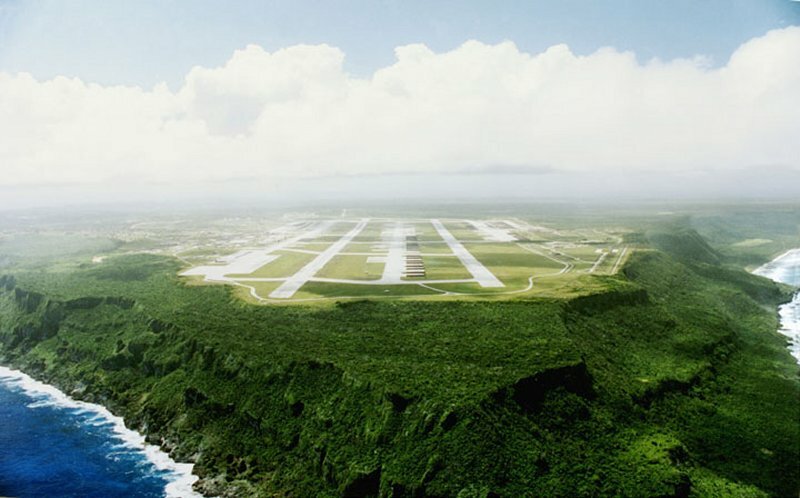 Andersen Air Force Base (AFB), Guam is located on the north end of Guam, approximately 15 miles from the capital, Agana. Andersen AFB is in the village of Yigo, pronounced "Geego." There are plenty of recreational and travel opportunities which make Andersen a popular tour among the adventurous. Most tours are 24 months (accompanied) and 15 months (unaccompanied). Andersen Air Force Base opened as North Field in 1944, and was primarily used as a B-29 staging base in the Pacific during WWII. Later it was renamed after Brigadier General James R. Andersen, former Chief of Staff for the Army Air Force, Pacific, who was lost at sea returning to Honolulu in 1945. The base continues to support strategic operations in the region, and serves as a staging base for activities in Asia and the South Pacific. The bulk of Andersen's duties since WWII have been as a Strategic Air Command (SAC) base, supporting activities in Korea and Vietnam. Andersen Air Force Base has been the focal point of United States Air Force strength in the Pacific Far East for more than 50 years. During the early years of World War II, U.S. military leaders formulated a strategy to defeat Japan by invading its homeland. However, the production of the B-29 Superfortress significantly altered those plans. Army Air Force leaders then envisioned long-range, very heavy bombardment missions carried out by the B-29 over Japan, thus precluding the need for a large-scale invasion of the Japanese homelands. To make the Army Air Force plan work, airfields were needed close enough to Japan to be within striking range of the B-29. The Army Air Force built and maintained three airfields on Guam: Depot Field, a B-29 aircraft depot and maintenance base (later renamed Harmon Field in honor of Lieutenant General Millard F. Harmon); Northwest Field, a combined B-29/fighter base; and North Field, a B-29 facility. Construction of the first B-29 airfield -- North Field -- began in November 1944. Andersen traces its roots back to a tent on Pati Point in 1944 during the early days of World War II when four men of the 854th Airfield Construction Battalion "Spearheaders" stood at a drafting table, drawing lines on a blueprint. Those lines would define the runways, taxiways and parking aprons that would later become Andersen Air Force Base. The area on Guam on which the Spearheaders drew the lines was known as a forest area - an almost impenetrable stand of trees and brush that covered the northern end of Guam. By February 1945, a runway complex was operational at what was then known as North Field. On 3 February 1945, one of two runways was completed and the first B-29 landed on the field that day with Major General Curtis E. LeMay Jr. at the controls. On 25 February 1945, wing crews flew their first combat mission from North Field. By June 1945 the finishing touches were almost complete and North Field aircraft began daily bombing missions over Japan. Also on 25 February 1945, a B-24 Liberator carrying Lieutenant General Millard F. Harmon, commanding general of the Army Air Forces/Pacific Ocean Areas (AAF/POA) and Brigadier General James R. Andersen, his chief of staff, departed Guam for Washington, D.C. via Kwajalein and Hawaii. Their aircraft reached Kwajalein Island safely, but disappeared the next day after taking off for Hawaii. The aircraft was never found and there were no survivors. He was declared dead on 25 February 1946, one year after he disappeared. In 1947, when the Air Force became a separate branch of the service, North Field was renamed North Guam AFB. Then, on 7 October 1949, it was renamed Andersen AFB in honor of Brigadier General James Roy Andersen. He was born in Racine, Wisconsin in 1904 and graduated from the U.S. Military Academy in 1926. In 1944, as a colonel, he went to Hawaii as Chief of Staff, Headquarters, Army Air Forces, Pacific Ocean Areas. He was the principal planner for the move of the headquarters to Guam, which was accomplished in January 1945. That same month he was promoted to brigadier general. During the years between World War II and the Korean War, Guam was a consolidation and disposal point for surplus war materials that had accumulated in the Pacific Theater. Until June 1950, Andersen AFB was a transition point for retrenchment and from October 1949 to June 1950, B-29 training continued at Andersen AFB. On 28 June 1950, three days after North Korea invaded South Korea, B-29s from the 19th Bomb Group, Andersen AFB, bombed targets in South Korea. Within a few days, the 19th Bomb Group was detached from 19th Bomb Wing control and deployed to Kadena AB, Okinawa. The wing, meanwhile, remained at Andersen AFB in an admini-strative and logistics capacity. Base personnel provided maintenance for transient aircraft and operated ammunition dumps for the next three years. In 1951, Andersen AFB was one of several overseas locations selected by the Strategic Air Command (SAC) to support rotational unit deployments of its bomber forces from stateside bases. A number of squadrons of B-50 bombers and KC-29 refueling tankers with support personnel subsequently de-ployed to Andersen for 90-day rotational duties. When the Korean War ended in mid 1953, the headquarters of the 19th Bomb Wing moved without personnel and equipment to Kadena. At the same time, the Far East Air Forces (FEAF) on 1 June 1953 activated the 6319th Air Base Wing at Andersen AFB. The 6319th essentially carried out the same mission of its predecessor. With the tenuous cease-fire in Korea, SAC deployed the 92d Bomb Wing, with its B-36's, to the Far East. The wing stopped at bases in Japan and Okinawa as well as Andersen during a 30-day operation named Big Stick. To assure the peace in Korea, the Air Force maintained a large force in the Far East. By early 1954, however, HQ USAF directed that the FEAF Bomber Command (composed of FEAF's 19th Bomb Wing, and SAC's 98th and 307th Bomb Wings) be discontinued and that the three B-29 wings be returned to the U.S. and equipped with B-47's. Concurrent with this move, HQ 3d Air Division was activated at Andersen AFB on 18 June 1954 to control all SAC units operating in the Far East. From June 1954 until April 1955, the 3d Air Division operated as a tenant unit on Andersen, receiving host-base support from the 6319th ABW. In the interim, SAC continued to deploy its bombers to Andersen under the 90-day unit rotational training program. In October 1954, the 92d Bomb Wing deployed to Andersen, marking the first time an entire B-36 wing had been deployed to an overseas base. Meanwhile, negotiations started for the transfer of Andersen AFB from FEAF to SAC. On 1 April 1955, formal transfer took place. To complete this action, FEAF's 6319th was inactivated, and SAC's 3960th ABW became the host unit at Andersen. Its primary mission was to support the rotational program of the CONUS-based bomber wings to Guam. With the increased strategic importance of Andersen AFB established, additional construction began in support of SAC operations. Over the next several years, more and more permanent facilities were built and existing structures were rehabilitated. The face of Andersen AFB changed substan-tially. The value of real property assets at Andersen by the end of 1956 was estimated at more than $115 million. During the last half of the 1950's, support continued for the numerous bomber units deployed to Andersen AFB. In July 1956, B-47s began rotational duty on Guam, replacing the B-36s. The 43d Bomb Wing performed this duty at Andersen from July to October 1957. The wing, stationed at Davis-Monthan AFB, Arizona, eventually became the host unit at Andersen. In addition to bomber activities, the air defense of Guam, much discussed at the time, was realized at Andersen. From August 1956 until March 1960, the 41st Fighter -Interceptor Squadron of the Pacific Air Forces was stationed at Andersen AFB with its F-86 aircraft. After the 41st was inactivated in 1960, the air defense mission was provided by deployments of 5th and 13th Air Force units flying the F-102 aircraft. In the early 1960's, a variety of events occurred at Andersen AFB that affected operational as well as base activities. Contractors completed construction of 1,050 Capehart family units in 1962, which alleviated much of Andersen's housing shortage. In spite of efforts to make the base's faci-lities withstand the onslaught of typhoons, Andersen AFB and Guam experienced its worst typhoon to date on 11 November 1962. Typhoon Karen with winds in excess of 200 mph passed directly over the island and brought extensive destruction to the base. A two-phase rebuilding program began immediately to restore the base over the next several years. In the meantime, the phaseout of the B-47 in the 1960's signaled an end to its rotational duties at Andersen. In March 1964, the B-52 Stratofortress "City of El Paso" from the 95th Bomb Wing, Biggs AFB, Texas, arrived at Andersen AFB. In April 1964, the first deployment of B-52s to the base began a new era for Andersen AFB. The unit rotational program to Andersen had extended the range of the SAC global strategic deterrence mission; however, events of a different nature brought an expanded role for Andersen AFB and its personnel. In June 1964, KC-135 Stratotankers assigned to the Andersen Tanker Task Force were used for the first time to support combat operations in the growing Vietnam conflict. By early 1965, SAC began to augment the squadron-size unit of B-52s at Andersen. A formidable force was assembled at the Guam base by 18 June 1965, and 30 of the bombers lifted off that day to initiate a new phase in the Vietnam War known as the Arc Light missions. This use of B-52s in a conventional bomber role lasted for the next 8 years with a pause from August 1970 to early 1972. Activity at Andersen AFB increased greatly during this Arc Light era. The base felt the pressures from more personnel and aircraft in various ways, but nothing compared to the impact of renewed bombing efforts in 1972. From early 1972, Andersen AFB was the site of one of the most massive buildups of air power in history. The influx of bombers, crews, and support personnel pushed Andersen's military population past 15,000. Over 150 B-52's lined all available space on the flight line. Combined with other SAC bombers stationed at U-Tapao Field, Thailand, about 50 percent of SAC's total bomber force and 75 percent of all combat ready crews -- equivalent to at least 13 stateside bomber wings -- were at the two bases. Billeting at Andersen was saturated, and terms like "Tin City" and "Tent City" became commonplace with improvised quarters set up in the open fields across from the flight line. The bombing in the first half of 1972 only set the stage for SAC's most imposing and carefully planned operations in its history -- the 11-day campaign from 18 to 29 December 1972, known as Linebacker II. On 18 December 1972, during a one hour and 43 minute period, 87 B-52s departed Andersen AFB for targets in Hanoi. These aircraft were joined by approximately 40 bombers from U-Tapao. On 29 December, the last B-52 to participate in this climatic operation landed at Andersen. A total of 729 B-52 sorties were flown in that 11day period. The effectiveness of Linebacker II missions ultimately resulted in a truce in Vietnam. A bombing halt ensued in Vietnam, but Andersen B-52s continued missions over Cambodia and Laos until 15 August 1973, when all bombing missions ceased. In the meantime, the base inaugurated the largest in-house flight-training program ever conducted from a single base. The end of bombing in Southeast Asia consequently saw the beginning of redeployments by the end of September 1973 and within a month, more than 100 B-52s, both D and G models, left Andersen AFB. A return to normalcy slowly prevailed at the base by early 1974. During the period of Arc Light, the surge in base activity saw a host of reorganizations in Andersen's command structure. On 1 February 1966, SAC activated the 4133d Bombardment Wing (Provisional) at Andersen with host-base unit responsibilities still assumed by the 3960th Strategic Wing, originally activated in 1955 as the 3960th ABW. On 1 April 1970, HQ Eighth Air Force replaced 3d Air Division and the reactivated 43d Strategic Wing replaced the 3960th, also on that date. The 43d assumed the mission of the 4133d on 1 July 1970. This arrangement remained intact until June 1972. The resurgence of bombing efforts in early 1972 were carried out under a new operation called Bullet Shot. The tremendous influx of aircraft, personnel, and equipment to Andersen resulted in activation of the 57th Air Division (Provisional) and 72d Strategic Wing (Provisional) on 1 June 1972. A month later, the 303d Consolidated Aircraft Maintenance Wing (Provisional) was activated. These provisional units remained at Andersen until 15 November 1973. The inactivation of the provisional units subsequently allowed the 43d to resume the pre-Vietnam mission of strategic deterrence, but the wing still sent crews to U-Tapao as SAC maintained a visible presence in Southeast Asia. As a tribute to those killed during the Arc Light missions, the base dedicated the Arc Light Memorial on 12 February 1974. As operations diminished in Southeast Asia, HQ Eighth Air Force moved to Barksdale AFB, Louisiana, and the 3d Air Division was reactivated at Andersen on 1 January 1975. The base, however, remained in the forefront of the Vietnam conflict. The Communist forces overran South Vietnam and the situation was hopeless for the Saigon government by April 1975. As a result, emergency airlifts from Vietnam flooded Andersen with people once again. This time, the U.S. began Operation New Life, which provided emergency relief and shelter for thousands of Vietnamese evacuees fleeing the Communists. After the fall of Saigon, Andersen received almost 40,000 refugees and processed another 109,000 for onward transportation to the United States. In 1976, operational commitments took SAC crews to Australia. In addition, the base and the island again experienced devastation wrought by the weather. Super Typhoon Pamela struck the island on 21 May 1976, extensively damaging the base. Estimates to restore destroyed and damaged facilities were placed at approximately $80 million. Restoration of the base began immediately, but it was several years before the effects were overcome. The post-Vietnam period at Andersen AFB brought a relative return to routine operations, but changes in the 43d's mission also saw the base remain a vital overseas base in carrying out SAC's global deterrence mission. The importance of Andersen AFB with its key location took 43d crews and aircraft as far south as Australia and as far north as Alaska. New taskings also required recurring missions to Korea and support for the U.S. Navy in sea surveillance operations. By 1983, the wing completed a conversion from the B-52D to the B-52G. This conversion was a prelude to even more diversified taskings when the 43d became one of only two SAC bomber wings equipped with the Harpoon anti--ship missile as well as a change to Short Range Attack Missile (SRAM) equipped B-52Gs. Andersen's auspicious beginning in 1945 as a B-29 base eventually led to the basing of all types of SAC strategic bombers over the years. Andersen's location in the hub of the Western Pacific has not only allowed the U.S. to maintain a global deterrence mission in this part of the world, but also the years proved that Andersen and its personnel were ready to support numerous contingencies and missions. In October 1988, Andersen AFB traded its nuclear deterrent role for that of a conventional one. On 1 October 1989, the 633d Air Base Wing, a Pacific Air Forces organization aligned under Thirteenth Air Force, was activated on Andersen AFB and became the host unit. As such, it provided services for the various tenant "team members." This marked the transfer of Andersen AFB control from Strategic Air Command to Pacific Air Forces. All support units of the 43d Bomb Wing were inactivated on 30 September 1989. The 43d Bomb Wing itself inactivated on 26 March 1990. The 60th Bombardment Squadron (Heavy), of the Strategic Air Command inactivated at Andersen AFB on 30 April 1990. In August 1990, Andersen AFB personnel began shipping over 37,000 tons of munitions to forces in the Persian Gulf during OPERATIONS DESERT SHIELD and DESERT STORM. Over 30,000 tons went by sealift. In addition, over 2,200 troops and 2,200 tons of cargo were processed aboard 200 aircraft. In June 1991, OPERATION FIERY VIGIL, the evacuation of the Philippines due to the eruption of Mt. Pinatubo, resulted in over 20,000 American evacuees and over 1,100 pets being cared for at Andersen AFB. On 2 December 1991, Headquarters Thirteenth Air Force stood up on Andersen AFB after evacuating Clark AB in the Philippines. On 1 October 1994, the 633d Air Base Wing was inactivated and the 36th Air Base Wing was activated in keeping with the Air Force Chief of Staff''s policy of keeping the most highly decorated and longest serving Air Force units on active duty. The 36th Fighter Wing was inactivated at Bitburg AB, Germany on 1 October 1994. PACAF hosts two of the most distant bomber-operating locations in the world, and it encompasses the largest geographical region of responsibility. The two islands -- Guam, and the British Island of Diego Garcia -- offer planners the ability to project airpower to any crisis location in Southeast or Southwest Asia. But more importantly, they provide the United States the ability to arrive at those locations quickly. Besides the two staging bases, PACAF's vast international waters provide a clear route for the bomber missions. With the aid of KC-135 and KC-10 refuelers, modern bombers can take off from a stateside base, strike locations throughout the Pacific region within 24 hours and return home without ever landing. Andersen does not require clearance because it is a U.S.-controlled territory. No second-country permission is necessary to launch strikes from there. Andersen has long been used for this purpose, including Korean War and Vietnam War missions. Recent improvements to munitions and bomber aircraft have shifted U.S. military focus to expanded use of long-range conventional bomber strikes. Long-range bombers for many years were relied on for strategic rather than conventional warfare capability. On 20 March 1998 approximately 250 personnel from the 509th Bomb Wing deployed to Andersen AFB, Guam, via C-5A cargo planes, as part of Island Spirit, a 10-day Global Power exercise. Three days later, the Spirit of Louisiana and Spirit of Pennsylvania left Whiteman for Andersen AFB, Guam. All aircraft returned April 5 April while the deployed personnel arrived home during the week of April 12. This first deployment of the B-2 Stealth Bomber to a forward-operating location ended April 2 when the two aircraft departed Andersen Air Force Base, Guam, for the United States. The 10-day deployment tested every aspect of operating and maintaining the Block 30 aircraft away from their home station at Whiteman AFB, Mo. Because of recent storm damage to Andersen's hanger, at least one of the bombers was left outside, subject to both direct sunlight and driving rainstorms. Most maintenance, including that of the low observable coatings, was performed outdoors. The tropical weather had little effect on the maintenance and operations of the aircraft. The bombers achieved a 100 percent sortie success rate, accumulating almost 90 flying hours before returning to the United States. The B-2s' stealth characteristics were tested prior to arriving in Guam and were retested upon return to the United States to determine the level of success of the low observable maintenance and the effects of tropical climate. Two global power missions successfully deployed to Andersen Air Force Base, Guam, 11 February 1999, demonstrating once again the US Air Force's ability to strike targets across the globe from its home bases. Two B-2 Spirits from Whiteman AFB, Mo., and two B-52s from Minot AFB, N.D., deployed 09 February 1999, flying nearly 20 hours across the international date line to targets at the Farallon de Medinilla Island Bombing Range in the Pacific Ocean. The B-2s dropped live 2,000-pound bombs and the B-52s dropped BDU 44s, which are training bombs. After completing their mission, the aircraft landed at Andersen. The B-2s, which were on the runway for less than an hour while they were refueled and crews were switched, returned to make a second strike at the Farallon bombing range and then flew home to Whiteman. One of the B-52s departed from Andersen to the 1999 Australian International Air Show and the other B-52 will return home to Minot. The 93rd Bomb Squadron deployed to Anderson AFB, Guam, in April 1999 to participate in exercise Tandem Thrust 99. The primary mission was to provide friendly and enemy air support for the US Navy. They deployed two aircraft and 102 personnel to train US and Australian defense force staffs in crisis action planning and execution for contingency operations whether at sea, in the air, or ashore. B-52's dropped bombs on Farallon de Medinilla. Over 500 M117's were dropped by the B-52s. Each day the aircraft were loaded internally and externally with the 750 pound bombs to be dropped 3000 feet over Farallon de Medinilla. From 05 September through 13 October 1999 three B-2s from the 509th, along with a support contingency, deployed to Andersen AFB, Guam, for an extended Global Power mission exercise. While at the Pacific island, the B-2s integrated operations with the venerable B-52. A supertyphoon with sustained winds of 150 mph struck Guam, on Dec. 8, 2002 and has left the island without power and water and only limited telephone service. Damage to Andersen Air Force Base included loss of power, water and major damage to base structures and more than 1,000 downed trees. Several hangars on base sustained damage to their walls and roofs, and many street signs were down. There is some flooding damage to the base housing units and surrounding community. Hangars 2, 3, and four suffered extensive damage. Typhoon Pongsona began pounding the base at about 8 a.m. locally and did not let up until the eye of the storm passed overhead in the early afternoon. Approximately an hour later the storm's fury returned and continued until about 10 p.m., said Yates. Gusts topped out near 200 mph, according to the Federal Emergency Management Agency. Relief supplies from throughout Pacific Air Forces were expected to arrive Dec. 9, said Yates, and base people were helping each other, especially those whose spouses are deployed supporting Operation Enduring Freedom. Andersen Air Force Base went into Condition of Readiness 1 (Emergency) at 1:45 p.m. Sunday although the base started feeling the first winds of the typhoon at about 9 a.m.
Air Force members of the Pacific Air Forces continue to support relief efforts in Guam 10 days after Super Typhoon Pongsona hit the Island which is roughly three times the size of Washington D.C.
More than 200 members from PACAF are deployed to the U.S. territory from Hickam Air Force Base, Hawaii, Elmendorf AFB, Alaska and Yokota Air Base, Japan. The people who deployed are Civil Engineers, Services personnel, medical experts, aircraft maintainers and Security Forces members. More than 30 Air Force missions on PACAF and Air Mobility Command aircraft took these airmen and supplies, including more than 1,000 tons of professional gear like a four-bed expeditionary field hospital, water tanks, generators, medical supplies and numerous building materials including items like plywood and rope, to Guam. Initially, the Hawaii Air National Guard provided some much needed relief by airlifting 19 civil engineers and other personnel from the 15th Air Base Wing at Hickam to Andersen Air Force Base with supplies. Officials said the runway was closed for a short time during the most intense part of the storm, but is open and accepting relief flights with supplies on them from the Federal Emergency Management Agency onboard. On April 12, 2006, Andersen AFB's host unit, the 36th Air Base Wing was officially redesignated as the as 36th Wing. Prior to the redesignation, the wing had been using a temporary designation of the 36th Air Expeditionary Wing. The change in the wing's official designation was meant to better aligns Andersen with its mission statement: "To provide a U.S.-based lethal warfighting platform for the employment, deployment, reception, and throughput of air and space forces in the Asia-Pacific region." In its 2005 BRAC Recommendations, DoD would realign Andersen AFB, Guam, by relocating the installation management functions to Commander, U.S. Naval Forces, Marianas Islands, Guam.